On this week's Glee, Burt gets sick, leading the kids to examine their religious beliefs, or lack thereof. A nuanced discussion of religion prevents Glee from slipping into After School Special mode, making this one of the series' best episodes. Creator Ryan Murphy's recent declaration that this is one of the series' most controversial episodes left me with low expectations for "Grilled Cheesus". Last season, Glee featured several preachy moments, like when Quinn cured Mercedes' eating disorder with a granola bar and a paralyzed boy was called on to teach Rachel a lesson, then never spoken of again. The scenes were gag-inducing. However, this time Glee lived up to the hype. Murphy told Entertainment Weekly that he and the writers were striving to create a balanced story about religion with this episode so, "We went through and counted it word by word and line by line... Every time somebody said something anti-religion, we made sure somebody said something pro." As a result, Glee may have accomplished a prime-time first: An episode that was thoughtful, entertaining, and sympathetic to both believers and non-believers. It starts out with Finn finding religion in a grilled cheese sandwich when his George Foreman Grill produces a burn in the image of Jesus. 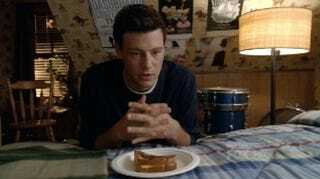 Though this still doesn't prevent him from eating the non-holy half of his sandwich, Finn comes to believe that "Grilled Cheesus" has the power to grant wishes after his prayer to win his next football game is answered. If I wanted to sing Jesus I'd go to church. And the reason I don't go to church is because most churches don't think very much of gay people. Or women. Or science. Puck isn't into the idea either. While he jokes that he's a total "Jew for Jesus," he doesn't like "people using J-money to cramp everyone else's style." Puck says for him spirituality is about living life to the fullest. He declares that he sees God, "every time I make out with a new chick," and expresses this sentiment by singing "Only The Good Die Young." All the kids rock out to Billy Joel, except Kurt, who sulks in the corner. Earlier at the Hummel house, Kurt gave his dad some typical teenage attitude and refused to go to their weekly Friday night dinner, a tradition his mom started. They part with Burt telling his son he's disappointed in him. This comes back to haunt Kurt when later that day, Burt suffers a heart attack that puts him in a coma. At school, the kids try to comfort Kurt. Brittney tells him, "I did a book report on heart attacks, if you want to give it to the doctors. It got knocked down a letter grade because it's written in crayon." Mercedes sings Whitney Houston's "As I Lay Me Down," with Tina, Quinn, and the harpist who happens to be sitting in class providing backup. Mercedes nails it, of course, but Kurt is unmoved. He explains that he finds all the God talk disturbing because he's believes, "God is kind of like Santa Claus for adults." He can't understand why God would make him gay, then allow his followers to torment him every day of his life. He isn't alone. Sue is angry — well, angrier than usual — because she finds singing religious songs on school property inappropriate. Emma confronts her in her office, asking why she wants to prevent the kids from helping Kurt. Though making one of the meanest women on TV an atheist doesn't sound like the best way to portray non-believers in a positive light, Sue busts out her seldom-seen sensitive side in this episode. For once, her issue with Schue isn't based on her Grinch-like hatred of all things glee-related, but her belief that pushing religion on Kurt is amoral. Meanwhile, Rachel tackles another Streisand hit, singing "Papa Can You Hear Me." She starts out singing on a moonlight picnic with with Finn (because Yentl was outside when she did the song in the movie), then she teleports to Burt's hospital room so she can sing the final lines while stroking the head of her boyfriend's sort-of dad. It's unclear if this is actually happening, since the show mixes real-life performances with fantasy sequences indiscriminately, but either way, it's a sweet moment. However, it doesn't even compare to the song Kurt sings for his dad during New Directions' rehearsal. He tells a story about his dad holding his hand and his mother's funeral, then manages to turn the Beatles' "I Want To Hold Your Hand" into a major tearjerker. Sniff! If you assumed that Little Kurt was played by Chris Colfer using Lord Of The Rings-style CGI, prepare to have your mind blown: The role was played by Adam Kolkin, a 13-year-old who looks freakishly like Colfer. God works in mysterious ways. But I'm pretty sure he doesn't spend a lot of time trying to speak to us through sandwiches. Finn expresses his crisis of faith by dancing through the halls while singing R.E.M. 's "Losing My Religion" and spying on Kurt as he cries in the library. She sings "Bridge Over Troubled Water," with her choir and advises Kurt that even if he isn't religious, he should believe in something. Later, Kurt tells his dad he believes in him and considers their relationship sacred, and Burt's hand twitches. The kids sum up their indecision about faith by singing the mid-'90s classic "(What If God Was) One Of Us," as Finn eats Grilled Cheesus. Week-old sandwiches taste great with a dash of blasphemy! Next week: The kids perform duets, Sam joins New Directions, and Mike Chang is finally allowed to sing a solo!